The top top room is our nicest room with a view of the Lamu Fort. The cool breezy top top room is ideal for couples on their honeymoon or anyone looking for a special place to stay in Lamu Town. Subira House is both architecturally and historically of great interest. 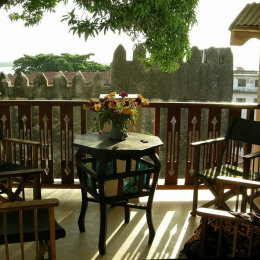 The House is located directly behind the Old Fort and Lamu Market, a block from the seafront. The historic home is in the middle of Lamu bustling a special UNESCO World Cultural Heritage Site. The house is an Arab style building with two open court yards, pretty arches and two beautiful gardens with a well. There are 7 bedrooms with two Pent Houses on the Top Terrace and many galleries where one can relax in the soft warm winds. The house was built about 200 years ago by Said Bin Sud, important and wealthy "Liwali", the governor of the Sultan of Zanzibar. His family resided here until 1972. Life at Subira House is inspiring and with the new WIFI internet access in the house you have great possibilities to focus your creativity. On the ground floor, the four women's quarters are now a self-contained flat of two bedrooms, two bath rooms, and a kitchen. There is an open courtyard with stairs leading to the roof - for watching the stars at night! This is a popular place to rent monthly and you cook for yourself. The breezy top top room is a favorite for couples with a splendid view of the Lamu Fort. The old building is restored with care, nicely decorated and managed with love and environmental ambitions. In 2010 it received Silver Ecorating by Eco Tourism Kenya. It is not just any breakfast; shamba (farm) eggs, home-made youghurt, island honey, Lamu fresh fruits, homebaked lovely bread, mango jam. Served at 7 pm and can be ordered the same morning from Michael our excellent chef with the help of Mwallim. A 3-Course Dinner is also available in the new quaint 12-seat Karkadeh Restaurant. Subira House has a small restaurant that's high ambitions just to cook using local produce, vegetables from the area some grown at Subira's farm on the inland of Lamu, and of course a lot of fresh seafood. Also their restaurant has a liquor license.